Crocodilians are indiscriminate, opportunistic feeders, and take a wide array of prey. Hatchlings feed on small prey, particularly insects, although some species in some habitats specialise on different foods (crabs, prawns/shrimp, fish). With increased body size, the size of prey eaten also increases, and vertebrates become more and more common in the diet. Large crocodiles can feed on prey as large as buffalo, cattle and horses. Crocodilians are most active at night, and consequently, most feeding occurs between dusk and dawn. However, they are opportunists, and their preference for nocturnal activity is easily overridden if prey presents itself. When ambient temperatures are low, appetite is usually depressed. American alligators do not feed at all during the winter months, when they are hibernating. Australian Freshwater Crocodiles eat little, if anything, during the dry season, and do most of their growing during the warm wet season. Saltwater Crocodiles feed all year round, although there is still a seasonal influence, with most feeding taking place during the wet season. Their digestive enzymes have optimal temperature ranges within which they function, and at low temperatures food will rot in the stomach before it can be digested. Most prey is taken at the water's edge. Small crocodilians usually lie in shallow water, snapping at disturbances within reach. With increasing size, more elaborate hunting strategies are developed. A “sit and wait” strategy is often employed, and at times they may swim actively towards prey. Some caimans are skilled at feeding off the bottom (eg mussels and other benthic fauna). 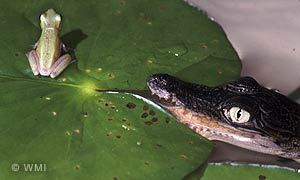 Various fishing behaviours have been described in crocodilians. Single individuals can cruise along the shoreline, swinging both their tail and head into the bank to trap fish. 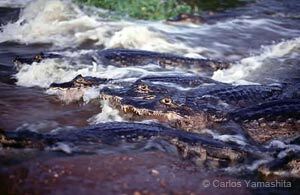 Crocodilians usually feed on their own, but where fish (or other prey) congregate in large numbers, so too can crocodilians. Groups of crocodilians can attack the one carcase of a dead animal, each inadvertently assisting the other to tear pieces away.